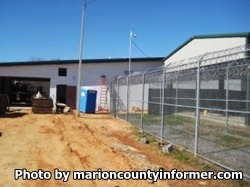 Marion-Walthall County Regional Correctional Facility is located in Columbia Mississippi. It is a medium custody facility that houses long term state commitments and pre-trial detainees. Offenders can earn a GED and take vocational courses in basic automotive repair and maintenance. In addition, inmates can receive substance abuse treatment and attend religious services. The visiting hours for this prison are currently unknown, if you know the visiting hours please leave a comment below. For more information contact the facility at the telephone number provided.